India is a destination right out of a storybook. There are the majestic monuments (the Taj Mahal is only one of many), the wild Bengal tigers that make up the fantastic beasts, and, of course, the colorful scenes to experience at the Holi Festival. Whether you're a spiritual traveler looking to deepen your yoga practice or a party-going backpacker seeking to indulge in the culture and nightlife, there is always something interesting to find in India. That is why we've narrowed down some notable features to make your next visit there a breeze. 1. Shop for trinkets and treasures untold in Old Delhi. There are many bustling bazaars to visit in the country's capital. The most popular one is Chandni Chowk, where you can get everything from jewelry to spices. You can expect the atmosphere to be chaotic so make sure you have some comfy walking shoes on. If the shopaholic in you wants more, you can also visit the Chor bazaar (also fondly called the "thieves market"), as well as Paharganj or the Tibetan market for some street art, local crafts, and assorted items for sale. 2. Get your yoga on in Mumbai. When you charter a trip to the birthplace of yoga, it is a must that you visit one authentic ashram. Naturally, there are many established centers to choose from. Parmarth Niketan Ashram, The Yoga Institute, Bihar School of Yoga, and the world-famous Iyengar Yogashraya, are some of the choice examples. 3. Feast on Indian thali in Udaipur. To dine as the locals do, go to Natraj Dining Hall in Udaipur. There you can get a taste of traditional Indian thali, which consists of a variety of little dishes. You get everything from veggie plates to freshly made chapati and chutneys—just all the good, sometimes spicy, stuff. It is typically served in a collection of small silver bowls. There is no menu provided; you are simply served with their available dishes for the day. The awesome part is that you can enjoy unlimited servings for just about $1.85 (or P92) per person. Just take a trip to the Bapu Bazaar area and from there, it will be a 30-minute walk from the City Palace. 4. Drop by Meenakshi Amman Temple in Madurai. If you want to take in India's culture and architecture, you'll need to visit some of its monuments. Of course you already know about the Taj Mahal, so let’s look into another great architectural masterpiece in the heart of the ancient city of Madurai. 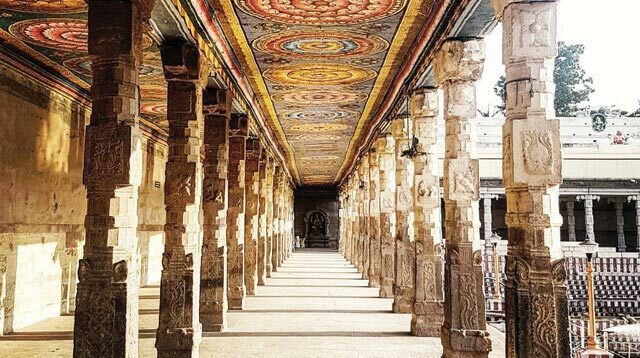 The Meenakshi Hindu temple has 14 towers in total, decorated with intricately carved stone figures. Temple dress codes are pretty strict so make sure to bring a sarong and a sleeved shirt to be safe. Goa has more than 30 spectacular beaches you can unwind in. Visit Tarkarli beach for snorkeling, Radhanagar beach if you're looking for somewhere remote, or maybe Arambol beach to get on with the hippie vibes. Our favorite by far is Mandrem beach, also called Ashvem or Morjim, which is known to be chill and trendy. A growing number of groovy little beach bars and restaurants is found here. If you're feeling adventurous, pack some sunscreen, trail snacks, and a heavy jacket and set a course for Ladakh. You'll find stunning views of snow-capped mountains and lush green grasslands along this mountain range. Many call it paradise and for good reason. Go for the Markha Valley and the Hemis Festival trek to see the sights, the largest monestary in the region, and if you're lucky, even some exotic wildlife. You can experience a full-on desert safari at India's largest state, Rajasthan. You can arrange for a camel to take you across to Jaisalmer and, as the sun goes down, camp out and lie under a gorgeous canopy of stars. Don't worry, camping in this dessert is not as isolated as it sounds. There are nearby tribal communities that are also open for you to visit. With the Bishnoi tribe, you can even take part in traditional ceremonies with the locals. If you're looking for some glamping time, on the other hand, there are some luxe accommodations like Camp Chhatra Sagar, which you can check into.